In keeping with that observation, my purpose here is to outline the requirements for the ultimate social service that the government of the United States can provide: the defense of Americans and their interests, at home and abroad. The government of the United States was created to serve limited purposes, among them to “provide for the common defence … and secure the Blessings of Liberty to ourselves and our Posterity.” The United States owes liberty to no one but its citizens, though the liberty of others may help to ensure the liberty of Americans. A grand strategy that promotes the liberty of Americans cannot be complete unless all components of the federal government are aligned with it. What follows is a prescription for the “common defence” that is not restricted to the Department of Defense. The broader reach of this prescription becomes evident in the latter portions of this post. Nuclear deterrence, as a strategy, was adequate for a particular place and time: to forestall Soviet aggression toward Europe in the 1950s. It was succeeded in the 1960s by the strategy of “flexible response,” that is, the deterrence or defeat of Soviet aggression in Europe with a combination of nuclear and “conventional” forces. The latter would be capable of waging a prolonged land-air-sea campaign against Soviet forces, while also dealing with threats to U.S. interests in other parts of the world. In other words, the Great British Public (or a sizable portion of it) was eager to resume its ill-advised love affair with socialism. Commenters have noted, some with puzzlement, as to why the domestic economy figured in this speech. Seen through a domestic policy lens, it’s obvious — Americans, with upcoming elections, are worried about the domestic economy, and this foreign stuff, even when it is a major war, is merely a side-show and distraction from the domestic agenda that is, at bottom, both what American voters care about and what the Obama administration has always truly cared about, even if those two have sharply divergent views as to what the domestic policies should be, to judge by the polls. Seen through a foreign policy lens, however, the answer is somewhat the same, but emphasizes a different point. That point is that the Obama administration proposes that the United States should embark on an extended period of in-turned focus upon its domestic issues but that, seen from the standpoint of the rest of the world, friend and foe alike, it looks very much like America wants a good, long, global nap. I’m a conservative critic of this whole idea; I don’t think that would work out very well for the United States, for our friends and allies, or really for anyone — including many of our enemies, active and passive — who rely on the US for the provision of certain basic public goods in both global security and the global economy. It is clear (to me) that Obama is willing to take the risk that bad things won’t happen, and to paper over that risk with high-sounding hopes for diplomacy and “multinationalism”? Why is he willing to take that risk? So that he can push resources in the direction of his domestic agenda. Obama’s so-called strategy is nothing more than an excuse for the continuation of the American left’s ill-advised love affair with socialism. The U.S. operates 11 large carriers, all nuclear powered. In terms of size and striking power, no other country has even one comparable ship. The U.S. Navy has 10 large-deck amphibious ships that can operate as sea bases for helicopters and vertical-takeoff jets. No other navy has more than three, and all of those navies belong to pur allies or friends. Our Navy can carry twice as many aircraft at sea as all the rest of the world combined. The U.S. has 57 nuclear-powered attack and cruise missile submarines – again, more than the rest of the world combined. Seventy-nine Aegis-equipped combatants carry roughly 8,000 vertical-launch missile cells. In terms of total missile firepower, the U.S. arguably outmatches the next 20 largest navies. All told, the displacement of the U.S. battle fleet – a proxy for overall fleet capabilities – exceeds, by one recent estimate, at least the next 13 navies combined, of which 11 are our allies or partners. And, at 202,000 strong, the Marine Corps is the largest military force of its kind in the world and exceeds the size of most world armies. As if certain numbers of ships, aircraft, missiles, displacement tons, and Marines can be thought of as “too many” without reference to potential and actual threats. As if those numbers should not be out of proportion to the numbers owned by prospective enemies. As if it were somehow wrong to possess a large Navy and Marine Corps, when the U.S. has far-flung interests to protect. Our Navy has to be designed for new challenges, new technologies, and new missions – because another one of history’s hard lessons is that, when it comes to military capabilities, those who fail to adapt often fail to survive. In World War II, both the American and British navies were surprised by the speed with which naval airpower made battleships obsolete. Because of two decades of testing and operations, however, both were well prepared to shift to carrier operations. We have to consider whether a similar revolution at sea is underway today. Potential adversaries are well aware of our overwhelming conventional advantage – which is why, despite significant naval modernization programs underway in some countries, no one intends to bankrupt themselves by challenging the U.S. to a shipbuilding competition akin to the Dreadnought race before World War I. Instead, potential adversaries are investing in weapons designed to neutralize U.S. advantages – to deny our military freedom of action while potentially threatening America’s primary means of projecting power: our bases, sea and air assets, and the networks that support them. We know other nations are working on asymmetric ways to thwart the reach and striking power of the U.S. battle fleet. At the low end, Hezbollah, a non-state actor, used anti-ship missiles against the Israeli navy in 2006. And Iran is combining ballistic and cruise missiles, anti-ship missiles, mines, and swarming speedboats in order to challenge our naval power in that region. What will happen, of course, is that the “excess” forces will be pared, in sacrificial homage to deficit reduction. But it will be a long time — if ever — before the gaps are filled with more “relevant” forces. Even if Mr. Gates does not mean to help Obama achieve some kind of limited, unilateral disarmament, that is precisely the end that will be served by his facile and irrelevant comparisons. When I say that a grand strategy “anticipates an evolution of threats and points to a defense posture that is capable of dealing with that evolution,” I do not mean that the nation’s security posture should be determined by a sequence of set-piece scenarios. These are easy enough to conjure — for the near future, at least — but they focus on known knowns. A grand strategy worth its name should yield a coherent defense posture that can accommodate unknown unknowns. 1. Describe a complete defense-in-depth; that is, prepare an exhaustive outline of the ways in which the nation must be able to defend itself, even against threats that have not (and may not) materialize. The implausibility of a potential threat is no proof against its materialization. 3. Test alternative defense postures against demanding and feasible scenarios, in various combinations. The main purpose of this step is to test the robustness of the “affordable” defense budget, that is, its ability to provide a complete defense-in-depth against a variety of threats, near-term and long-term. This step yields a baseline against which the effects of lower defense budgets can be compared. 4. Assess the effects of lower defense budgets, by testing the capabilities they afford against the baseline obtained in step 4. 5. Prepare a detailed multi-year defense program and describe the risks it entails, relative to a complete defense-in-depth. 6. Present the results of steps 1-5 to Congress and the public. Members of Congress with a “need to know” (e.g., members of the subcommittees for Department of Defense authorizations and appropriations) would have access to classified information. An unclassified version would be published and distributed via the internet. 6. The ensuing political debate — in the press, over the internet, and in Congress — would culminate in the adoption of a defense budget for the coming year and adjustments to the multi-year defense program. 7. Repeat the process every two years, but change the cast of characters involved in steps 1-4. The rest of this post focuses on step 1.
point to specific, technologically feasible, program and budget recommendations for shoring up areas of weakness. It may be possible to devise and implement a grand strategy based on military disengagement from the wider world — one that focuses on homeland defense, rapid responses to emerging overseas threats, and nuclear retaliation. But disengagement is not the proper starting point. Any strategy that cedes forward defenses and preemption can be viewed by an adversary as an invitation to seize (or be capable of seizing) critical masses of land, water, and space, to the grave disadvantage of Americans’ interests. Forward defenses and preemption — like them or not — can prove more effective and less costly than reactive defense postures. Some enemies cannot and will not be deterred. They must be contained — and, when necessary — struck before they can strike or abet others with a penchant for anti-American violence. The world is not our oyster, but it is the source of much that brings prosperity and enjoyment to Americans. Any administration that claims to value to well-being of Americans should be prepared to defend the overseas sources of goods and services enjoyed by Americans — and the air, sea, and space through which those goods and services must travel. America is more despised that loved, for reasons varying from resentment to envy to inculcated hatred. The particular reasons are less important than the fact — of which most Americans seem ignorant — that the downfall of America would be greeted in much of the world with glee. This is true even of peoples who owe their liberty to the force of American arms and their prosperity to trade with Americans. I did not write “more feared than loved” because America is no longer feared. America would still be feared if, in the aftermath of 9/11, the forces of the United States had attacked terrorism and its state supporters relentlessly and decisively. But the wars in Afghanistan and Iraq were too limited — in part because of the shrinkage of American forces in the preceding decade — and partly because Americans — led by a generation brought up on anti-war rhetoric — have lost whatever taste they once had for all-out, decisive warfare. Afghanistan and Iraq have been Korea and Vietnam all over again, complete with halfhearted leaders, second-guessing pundits, and backstabbing politicians. Because America is both despised and no longer feared — and is unlikely to give the world a reason to fear it — its enemies are emboldened. Many Europeans — especially so-called intellectuals — view Americans (collectively) as boors and bullies, whose values are inconsistent with “enlightened” Europeanism, where the state reigns supreme over the individual and peace reigns by dint of the sacrifices of Americans. It would, however, be a strategic mistake to abandon Europe to its own devices and to the ambitions of Russian imperialists, UPDATE (04/06/14) which are (barely) repressed by the Russian leadership’s evident fear of NATO which are personified in Vladimir Putin (see this and this, for example). A “European” view of America is shared by many Americans — especially so-called intellectuals, whose views have migrated to the mainstream of American political thought. They believe that enemies can be won over by diplomacy and gestures of friendship. They believe, in sum, that peace is a product of hope, not preparedness and the will to fight. I make these points to emphasize another one: The search for a grand strategy should not and must not be diverted by the “strategy” of hope. That — as history proves time and again — is a strategy for retreat, if not defeat. It is equally important to keep the question of “affordability” in its proper place. Members of the executive and legislative branches should first ask what must be done to assure, with a high degree of confidence, the defense of Americans and their interests. Only after having asked and answered that question should they consider how much it would cost to do the job. Then, and only then, should they consider spending less than the full amount, while assessing and acknowledging the risks of doing so. A grand strategy — to be a real thing — must be more than a collection of words on paper. The true grand strategy will be whatever it is that can be accomplished by actual, well-trained human beings, equipped with reliable, state-of-the-art hardware and software, and backed by modern well-run installations, logistics, communications, and intelligence systems. “Affordability” can be measured by the costs of the Great Depression and World War II. The Great Depression was caused, in part, by an international trade war, triggered by protectionist impulses. Massive and successful attacks on telecommunications facilities, trade routes, and terminals could easily replicate the economic destruction wrought by the Great Depression. How costly was that destruction? In the United States, the Great Depression cost Americans about one-fourth of the GDP that they would otherwise have enjoyed during the years 1930-1940. What happened next was even worse. It was necessary for the U.S. to enter World War II — Pearl Harbor or not — in order to prevent encirclement, impoverishment, and possibly enslavement by the Axis powers. But, had the U.S. (along with Britain and France) prepared sufficiently, the Axis powers might have been deterred. Even if they had not been deterred, the Allies would have won sooner and at a lower cost in lives and treasure. As it turned out, World War II consumed one-third of the GDP of the United States in the years 1942-1945, peaking at 43 percent in 1944. Derived from Bureau of Economic Analysis, Table 1.1.5. Gross Domestic Product, available here. The current push to trim the defense budget is foolish on two counts. First, the huge deficits projected for the federal government arise mainly from commitments to continue and expand three major entitlement programs: Social Security, Medicare, and Medicaid (Obamacare represents an expansion of all three). Second, the defense budget should be geared to external threats, not to the federal government’s fiscal problems. Cutting the defense budget to fund profligate spending on “social services” is like preparing for a street brawl by spending money on a new suit instead of brass knuckles. 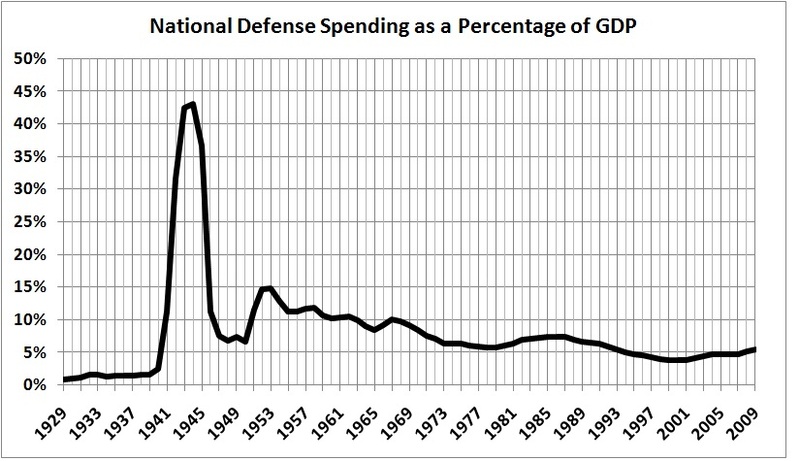 Rather than take money from defense, our “leaders” should be thinking about how to spend more on defense. There is nothing more inviting to an aggressor than his intended victim’s lack of preparedness. As the man says, “You can pay me now, or you can pay me later.” But if you choose to pay later, you will pay one hell of a higher price, if you are still alive to pay it. A grand strategy, as I have suggested, is a defense-in-depth that extends across time. It should not be based on a particular scenario, or a particular set of them. It should be based on a catalog of feasible threats to Americans and their interests, as those threats may change with the evolution of technology. Which is not to say that a grand strategy should fixate on technological advances, for — as the events of 9/11, 3/11, and 7/7 (among many others) should remind us — there always will be much to fear from determined, resourceful, and fanatical enemies whose main weapon is their victims’ lack of preparedness and resolve. Moreover — given the possibility of recurrences of 9/11 on a much larger scale, and the ever-present threat of cyber-war — a grand strategy cannot be built on the assumption that there will be ample time in which to mobilize the resources of the United States. I therefore submit that America’s posture vis-à-vis its actual and potential enemies must encompass the capabilities listed below. I am not equipped with the particular knowledge or expertise that would enable me to elaborate the points in detail. Accordingly, I restrict my commentary to arcane and off-beat aspects of a defense-in-depth. 1. Effective strategic and tactical intelligence, accompanied by effective counter-intelligence. Abolish the CIA’s analytical arm. Replace it with competing “red” teams, whose funding and eventual survival would depend on their accuracy in predicting developments that affect the security of the U.S. Hire unsavory characters, as necessary, for analytical and operational work, but keep a close eye on them and “terminate” them at the first sign of treachery. Monitor all international communications from sensors in space and overseas, under a legal grant of authority enacted by Congress. Everything else should be fair game, but only as authorized by “intelligence court” warrants under the scrutiny of a restricted number of executive officers and members of Congress. Prosecute leakers and publishers of leaks to the fullest extent of the law, without fail and regardless of rank or influence. Establish a separate prosecutorial office, staffed by “untouchables,” for that purpose. 2. Secure, hardened, and redundant telecommunications, transportation, and energy networks. Technology has eliminated, and will continue to eliminate, much of the need for business travel. This development is independent of the terrorist threat, though that threat may have accelerated an otherwise inevitable shift toward more productive means of business communication. The broader point is that telecommunications, transportation, and energy networks will not retain their present configurations. Technological innovation can, and will, make them more efficient and — at the same time — less vulnerable. Government should be in the business of protecting the networks from the outside, but the design of the networks should evolve from the inside. Otherwise, the “tail” of security will wag the “dog” of efficiency. Nuclear energy may or may not be more efficient than the alternatives, but it should be given a chance. If it really is “too risky,” why haven’t all existing plants been shut down? Offshore drilling platforms and production facilities in “sacred” places like ANWR can be protected more readily than foreign fields. That is merely to point out the hypocrisy of the green crowd, which tends to oppose “blood for (foreign) oil” but also opposes the best substitute for it, which is the home-grown variety. But I do not counsel government-dictated retreat from foreign oil; Americans are well served by market-based changes in energy supplies, and ill-served by tax-subsidized scams (e.g., ethanol). As long as foreign oil remains a competitive source of energy, the task of securing the energy network must include the protection of foreign fields and ports from terrorists and unfriendly regimes. The cost of that protection should not be assigned solely to the cost of obtaining foreign oil — contra libertarian isolationists — for the deterrent effect of a demonstrated willingness to defend Americans’ overseas interests is a plus for U.S. interests around the world. Although al Qaeda’s terroristic repertoire includes attacks on ground transportation and buildings, its favored way of terrorizing the U.S., beginning with 9/11, has involved the use and attempted destruction of commercial aircraft. This emphasis has, in turn, led U.S. officials to focus on the protection of scheduled passenger flights, with the result that the measures used to screen passengers have become so intrusive as to spark outrage in the U.S. The terrorists have “won,” in the sense that they are spreading fear and imposing heavy costs on Americans. And there is more to come. (See, for example, “Al Qaeda affiliate threatens more small-scale bomb attacks,” The Washington Post, November 21, 2010.) At some point, before it is too late, the U.S. government must focus on the real threat, which is not the mass of American travelers but an overseas-based network of terrorists who share a religion (Islam) and a hatred of non-Islamic cultures. In the meantime, other forms and nodes of transportation remain relatively unprotected. Low-cost threats against those forms and nodes will impose more costs on Americans. And then there are public buildings, shopping malls, energy production and transmission facilities, and water supplies. A purely defensive posture will leave Americans hunkered down. It is time for a real war on terror, which requires far more than the more-or-less conventional operations on display in Iraq and Afghanistan, and the use of UAVs in targeted killing. Which leads to the observations under the next two headings. 3. Quick response (at home and abroad) to tactical intelligence via special operations units (including units equipped for cyber-war as well as shooting skirmishes). Federal operations on U.S. soil, especially if they affect citizens and legal aliens, involve some tricky constitutional issues and real threats to liberty. But cunning enemies can exploit the demonstrated squeamishness of American governments, as we saw in the case of the “wall” between foreign intelligence and domestic operations that allowed the 9/11 attacks to proceed. Accordingly, top priority ought to be given to the working out of protocols that enable intelligence (foreign and domestic) to be collected and released to operational units — with proper authorization — in time for them to prepare and execute preventive action in the U.S.
4. The preemptive use of technological trickery (e.g., cyber-attacks), targeted killing, small-scale hit-and-run operations, and large-scale sea, land, and aerospace operations. Establish competing “dirty tricks” shops to develop cyber-war tools (e.g., Stuxnet), and enable the command authority to use the tools to disrupt the development of offensive capabilities by hostile regimes. Enable lightning strikes overseas by maintaining various kinds of “presence,” ranging from carrier battle groups to special-operations units. “Presence” has the added benefit of deterring overtly hostile acts. Wars are not won by air power alone. UAV strikes would be much more effective if complemented by the occasional hit-and-run, take-no-prisoners attack on known terrorist locations. If collateral damage, host-nation protests, and bad publicity bother you, you shouldn’t be in the business of defending Americans and their interests, you should be in the State Department or on Madison Avenue. 5. A large “standing army,” with a broad range of nuclear and conventional forces that are fully manned and trained, well-maintained and supplied, and technologically advanced. Much verbiage has been emitted over the years about the supposedly deleterious effects of inter-service competition and the duplication of certain types of forces. A time-honored example is the insistence of the Air Force, Navy, and Marine Corps (and the Army, to some extent) on maintaining their own (somewhat) duplicative) and (undoubtedly) competitive air forces. Whether this so-called competition and duplication is actually detrimental to the nation’s defense posture is another matter. I have never seen a good case made that the money would have been better spent in other ways. (Yes, the pundits often have their favored ways, but don’t we all?) The real problem seems to be a certain lack of neatness. Methinks the critics of duplication and competition suffer a kind of obsessive-compulsive disorder; they want the armed forces of the country to fit into neat, non-overlapping, perfectly balanced organizational boxes. Those critics should worry, instead, about the overall effectiveness of those forces vis-à-vis a broad range of potential threats. There is a way to obtain more bang for the buck; it is called competition. For the past 40 years, each of the military departments has been given a set of multi-year budget constraints, within which the department must could construct and propose its multi-year program. It would be a healthy, invigorating, and informative exercise to ask each of the departments (and other major players in the defense arena) to offer competing multi-year programs for the entire defense effort, not just their slice of it. These would be considered and evaluated in the course of the new defense planning and budgeting process, described earlier. In general, any serious effort to devise a defense-in-depth should assume that all present and prospective defense programs are candidates for modification or cancellation. Sunk costs are sunk; plans are not promises. Again, a grand strategy is not mere words. It is what the forces, systems, procedures, and people of the defense establishment (broadly conceived) are able to do, given the resources at hand or in train, under the direction of a command authority that (one hopes) is far-seeing, imaginative, flexible, and — above all — determined. American voters consistently elect members of Congress and presidents who are committed to peace, prosperity, and liberty at home through swift, sure justice and military preparedness. That condition will obtain only if there is a successful, bloodless revolution which ends the dominant role of the “progressive, one-world, hope-over-experience” crowd in the nation’s schools, universities, news outlets, and government bureaus. Their way is peace at any price but the price of preparedness. Their way is oppression at home (disguised as do-goodism) and capitulation abroad. It is the prospect of realizing the second condition — and through it, the first — that gives me somewhat justified hope for the future of the nation. In the alternative, there is this, this, and this. This entry was posted in War - Peace - Foreign Affairs and tagged defense spending, defense strategy, grand strategy, social services. Bookmark the permalink.